Provide comfort for the family of Joan Cummings with a meaningful gesture of sympathy. Joan Muriel (Kopischke) Cummings, 84 of Williamstown, MA died on Monday, April 1, 2019 at her home. She was born in Jersey City, New Jersey on November 14, 1934 a daughter of Hugo and Anna (Heinlein) Kopischke. She attended schools in New Jersey. Joan was employed at the National Bank, Litchfield Financial and the owner of Luxury Limo and BJs Ice Cream Shop, and she was last employed for Elder Services of the Berkshires. Joan was the widow of Albert James “Bucky” Cummings III, whom she married on September 11, 1955. He died on January 26, 2010. FUNERAL NOTICE: At Joan’s request there will be no services. To add to the Book of Memories, please visit www.flynndagnolifuneralhomes.com. To send flowers in memory of Joan Muriel Cummings (Kopischke), please visit our Heartfelt Sympathies Store. 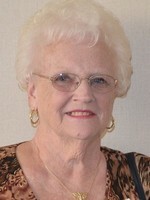 Provide comfort for the family of Joan Muriel Cummings (Kopischke) by sending flowers. We send our sympathy to the family of JOAN. She was a great friend and we will miss her wonderful cheer and personality. Love always Rita Bak and family. The world has lost a lovely lady. Take comfort in the memories and love you all shares. Joannie was one of a kind, a kind soul, loved by all. She will be missed by all. May you take comfort in the woman, mother, grandmother, friend that she was to so many. I will miss her infectious smile, always a happy camper. Sincere condolences to the family.